If you have been a part of the Joyous Tradition of the cutting of The Vasilopita, you know of its Beauty… If not, we urge you to begin This Year and make it a Cherished Family gathering to be relived every year on New Year’s Day! This Beautifully Minted Vasilopita Coin with the image of St. Basil The Great was designed by Father George Papadeas expressly for the purpose of this Wonderful Occasion. 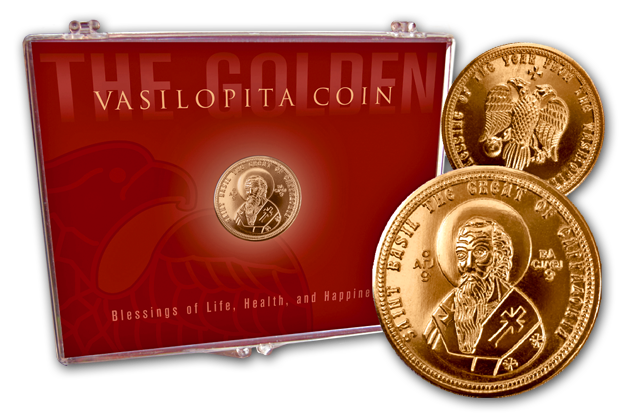 Each Coin is embedded in an impressive display and packed in a brilliant Lucite Presentation Case, along with a description and the concise history of The Vasilopita Story as well as our Favorite Vasilopita Recipe, and the traditional cutting instructions. Makes a Great and Very Thoughtful Gift!